Karachi: Businessmen and investors expressing concerns over free trade agreement (FTA) with China, said it would badly hurt the manufacturing sector of Pakistan. Addressing a ceremony on the completion of 10 years of trade with China’s Shenghong Corporation and Pakistan’s polyester yarn importer Asif Textile late Tuesday evening, Zahid Umer, senior member of Pak-China Business Council of the Federation of Pakistan Chambers of Commerce and Industry (FPCCI), said that there are talks of inclusion of 6,000 items in the duty-free import from China under the FTA, which will end Pakistani industry. The industry has concerns over inclusion of 3,000 items in the duty-free list trade with China, he added. local industry, he said Pakistani traders and industrialists are more interested in buying real state in Gwadar and are concerned about prices of their plots only, not the industry. Under CPEC, he said, very little contacts were made between people-to-people. “There is only government-to-government contact going on,” he added. Zubair Motiwala, former president of the Karachi Chamber of Commerce and Industry (KCCI), said that there is more demand for polyester yarn in Pakistan than its current imports. Pointing towards the local manufacturers, he said these people had suffered a lot in terms of tariff, taxes and other issues. “There is a scope for more polyester yarn exports,” he added. 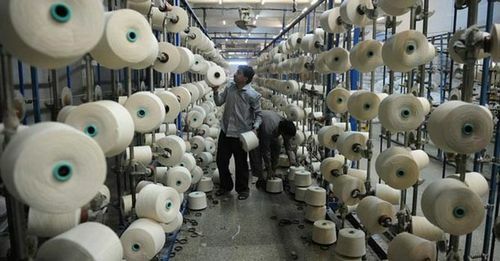 “Human- and environment-friendly polyester yarn can be developed, which is needed in Pakistan,” he said. There is a limit of producing cotton; thus, more demand for the polyester products is felt, as it is artificial and its production could be increased. Polyester is not only used in clothing, but could be used in dams and other building materials, he said. Terry Miao of Shenghong Corporation said that they are one of the largest polyester yarn manufacturers and catered to the local industry of China. He expressed the hope that their trade with the Pakistani partners continues beyond 30 to 40 years.